Wright Business Centre has both small and large-sized offices. Wright Business Centre has the perfect office space for your business. Wright Brothers offers comfortable, friendly, well-maintained office space in the Foothills Industrial Park. 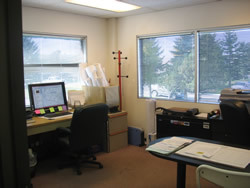 We have offices sized from 8' to 12' to 15' to 22'. Click here for information about our commercial, industrial or warehouse bays. Lease or month-to-month is available. We require one month's rent as security deposit. There are a minimum of two telephone lines pre-wired from the main telephone room to your office. There is a dumpster at the north end of the parking lot in which you can place trash from your office. 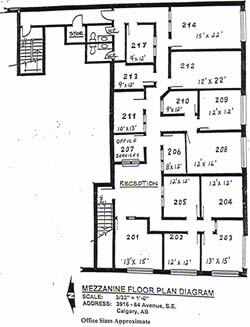 Here's the floorplan of our office spaces.